"The Sylvan Trail makes for a whirlwind trip you’ll be glad to have been a part of." Julianne Couch does not merely depict her characters, she inhabits them with a genuine compassion that anchors her stories with wit and humor. In her portraits of small towns and the people in them, Couch is so much more than a keen observer. With the precision of a gem-cutter, she frames not just places and people, but also the most precise moments when they are most fully and radiantly revealed to us. Julianne Couch's voice comes through clear and strong as a high-country river in her latest book, Along the Sylvan Trail. In this first novel, the characters' lives trace out in widening circles against the backdrop of a landscape wrought in color and hue, in the dapple of big, sunlit stretches of earth and sky, the "spice drawer of colors and textures framed in soft rectangles." In the midst of these interwoven tales of human strength, longing, weakness, and memory, characters take risks and find their lives rising like "skeins of geese" in the aftermath: "She had a strong sense that she'd given herself a gift in making this move that--like this place--she would have a long history here. She could see the key chapters ahead of her: her family, her friends, her home, her man, her career, the mistakes she'd make, the children she'd hope for, the wrinkles that would crease her skin, the losses she'd suffer, the mark she'd leave behind." There is a richness of hope, of tenacity and a willingness to dream, here in these pages and the characters who inhabit them. Along the Sylvan Trail is perhaps Julianne Couch's most extraordinary book so far, in all its plain-spoken, daily grace. In Julianne Couch's best prose, the land itself- from the mountains to the Mississippi- exerts an emotional gravity on the orbits of plainspoken Midwesterners traversing life in twenty-first century small-town America. --George Frazier author of The Last Wild Places of Kansas: Journeys into Hidden Landscapes. Those familiar with Julianne Couch's nonfiction know her as an adept chronicler of small-town America with perceptive insights on the personal bonds of family and place, the challenges of making a living in the current economy, and the distinctive wonders of dive bars. In Along the Sylvan Trail, she turns those same insights toward fiction in this episodic novel. Couch shows how it feels like to live, love and long in a world without guarantees. We're riding right along with these characters as they make decisions that could be the answer to their problems or the biggest mistake they've ever made. 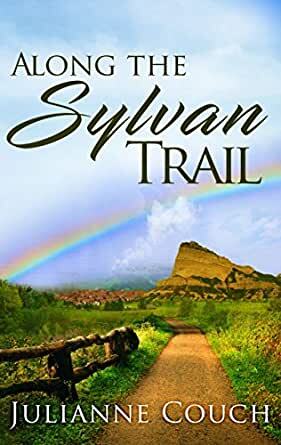 Along the Sylvan Trail is great reading, and this world sticks with you long after you put the book down. Readers who climb Ridge Hill and the Sylvan Trail through the characters' eyes make one wish that the landscape were real and that one could meet the characters in real life. The textured farmlands, timber, and wildflowers described provide a calming beautiful experience. Amber's passion for plants and living in nature related to me because I find that like Amber who hiked through trails, I hike through the mountains and walk through local greenhouses and nurseries which calm me in stressful times and feed my soul. In her debut novel, Along the Slyvan Trail, Julianne Couch introduces her audience to a lesser-known section of America, an enormous swath of territory ranging from the fertile Iowa farmlands to the high plains of Wyoming and Colorado. Using a series of almost stand-alone stories, Ms Couch presents a diverse set of characters, each claiming a unique connection to the small town of Slyvan Grove, Iowa. Through the actions of these characters, Ms Couch reveals the issues, attitudes, and livelihoods prevailing in this part of the country. With such a varied cast of personalities, Ms Couch makes it easy for the reader to identify with someone in the story. For me, that character was Maggie, a woman who struggles to balance the overwhelming responsibilities to her patients in an elderly-care center with her own pursuit of happiness. Though her characters present interesting situations, I found Ms Couch’s beautiful sensory depictions of western landscape to be the highlight of her book. Her poetic prose sweetly captures the sights and sounds of this beloved land. The story opens with a hawk-eyed view from the ridge overlooking the Sylvan Trail. This is an intimate view of Iowa's landscape that strangers might miss, and from here the story unfolds. The two central characters—Amber, the reserved biologist and Josie, the free spirit— demonstrate there is both an art and science to living and sometimes a gap between them that registers as longing. Among the many treasures Ms. Couch weaves into the tale Is a ghazal poem by which Josie describes her relationship with Amber using couplets, each ending in the word “trail”. The poem reveals how their identities have become entangled and enmeshed down the — blazing trail, rocky trail, breaking trail, waning trail, Emigrant Trail, vital trail, veiled trail, comet trails… And of course the Sylvan Trail. Through this less than free form structure Josie hopes to bridge a chasm between her way and Amber’s. There is more than meets the eye to this beautifully rendered story, though the author’s lush prose is a real treat to the senses. Ms. Couch guides us way beyond the flatlands of Iowa into the more tender and negotiable territory of the human heart and individual choices that inevitably impact more than us alone. Author Julianne Couch writes with effortless poise about characters negotiating lives for themselves in rural Iowa and elsewhere in "flyover country." Subtleties of relationships are portrayed without hammer blows or conceit, and the natural setting is an ever-present force in the narrative. Previously primarily a non-fiction writer, Couch brings equally astute observations to her characters' interior lives. My new favorite recommendation to fiction readers! Along the Sylvan Trail brings us from the Midwest to the West with people that reflect our own decisions in life and thrive in the unique, close culture of small towns and rural areas. The friendship between the two main characters is beautifully and honestly represented. The author’s love of the outdoors shines through throughout the novel. Beautifully written – a pleasant read.